The Sustainable Energy Raodmaps for Association of municipalities in SEE counties is developed within the regional project “Energy efficiency in municipal associations – EeMA”, on which the Union of Municipalities is a partner. The project is implemented by the German Agency for International Cooperation – GIZ, through its Open Regional Fund for Southeast Europe, and financially supported by the Governments of Germany and Switzerland. 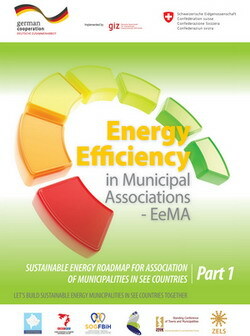 This Roadmap is a specialized type of strategic plan to outline activities that AoMs in SEE countries can undertake in order to proactively support the development of Sustainable Energy Municipalities in SEE countries. The first one focuses on challenges, barriers and benefits in the complex process of development of sustainable energy municipalities. • Exchanging of best energy practices in energy and energy efficiency field. • Development of Sustainable Energy Action Plan (SEAP), and the way data collection and analysis of consumption and reduce energy consumption in three sectors: building, transport and public lighting. Enclosed you can download the Roadmap.